Our Christmas shopping officially began this morning with me picking up a few items for the family and Mom doing the same later in the afternoon. In the midst of our shopping, we decided to stop for dinner. Mom suggested that we visit The Nephew's, and I quickly agreed as we hadn't been in quite a while. We were both in the mood for something other than Thanksgiving leftovers, and we figured that Italian food would definitely take our minds off of turkey and stuffing. We pulled into the parking area - located just off Exit 8 via Route 140 - at around 4:30 p.m. It was already starting to get dark outside, but that was nothing compared to the low lights at The Nephew's. 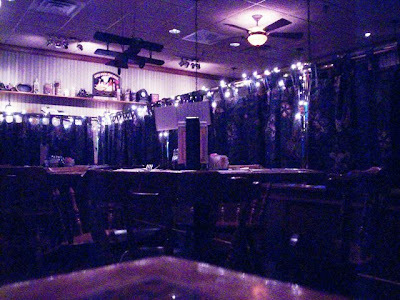 Believe me, this is not a complaint because I just adore dimly lit, cozy restaurants like this one, but it made getting clear photos almost impossible. I could have used the flash, but that would have drawn lots of attention to our table, and we definitely didn't want that. Mom and I were quickly seated by a hostess who brought us to a table right next to the bar. The rest of the restaurant has a sunken dining room, and I was hoping to be seated down there because, when you're sitting near the bar, there tends to be a lot of traffic with all of the customers and wait staff running back and forth. I guess I could have said something, but I was too weak from hunger and just wanted to sit down and eat. A waitress, who we think was named Karen, came over to take our drink order - two Diet Pepsis ($2.60 each) - and left us to look over the large menus that had been left by the hostess. Mom was undecided at first, but I immediately spotted a wild looking pizza combination that was just begging to be eaten. Karen returned to the table to take our order. 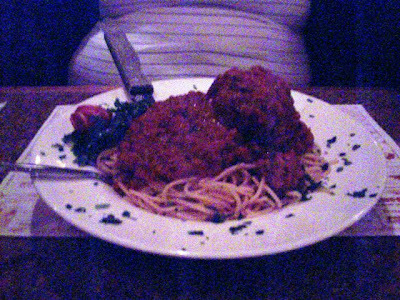 Mom chose the spaghetti with meatball ($7.45), and it honestly is just one meatball because the thing probably weighs about a pound. She also had a choice between regular and garlic bread, so she chose garlic. I went with the Pizza Caprese ($8.75) off of their specialty pizza list. It was covered in cheese and vegetables - I could barely wait! The pictures don't really do this restaurant justice. The Nephew's has a beautiful wooden bar, and hardwood floors and tables to match. The raised bar has a floral curtain that closes off the area to the patrons in the sunken dining room, and the various greenery and simple decor makes you feel like you're having dinner at your favorite aunt's house. The Nephew's seems to have a HUGE pizza take-out business, because all night long waitresses were rushing past Mom and I to hand several boxed pies over to waiting customers. Perhaps they are the only Italian restaurant in the small, country area, or maybe people just know a good thing when they see one! Before our entrees came to the table, Karen brought out Mom's garlic bread. It was deliciously soft and buttery, and the garlic taste was light and flavorful. Soon after Mom and I devoured the bread, our meals arrived. I could smell the tomato sauce on Mom's pasta, and various roasted vegetables on my pizza. I wish the picture of the meatball was a little more clear because it was HUGE! Normally, one would expect a large meatball like this one to be a little on the firm side because of the long cooking time. However, Mom's meatball was very tender and cooked perfectly. She didn't even need her knife; it just flaked apart with her fork. The sauce itself was thick, homemade, and very tasty. The pasta was well done and quite plentiful, and all in all Mom said it was a delicious meal. I'll start by listing the toppings on my pizza - pesto sauce, feta cheese, caramelized onions, eggplant, sliced plum and sun-dried tomatoes, and cheddar cheese. Wow, what a mouthful. 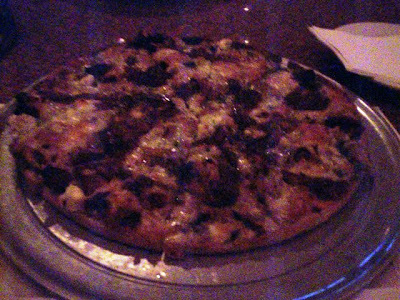 This pizza actually had a very sweet taste, probably due to the caramelized onions. It was hearty because of the meaty eggplant, which was cooked perfectly. The cheeses gave a salty kick to the plethora of vegetables, and the crust was thin, crunchy, and did its best to hold up under the weight of all those toppings. I even added red pepper flakes for some extra heat, and boy was I full after having this pie. Who needs toppings like pepperoni and sausage when you can have eggplant and tomatoes? It was absolutely delicious. We left $27 on the table for Karen, which included a 20% tip. She really did a great job. She also brought us a takeout menu upon request. Before heading out to do more shopping, Mom and I visited the restroom. It was clean and organized, but the paper towels were caught inside the holder, leaving us to dry our hands on our pants. Oh well - it happens in the best of places. 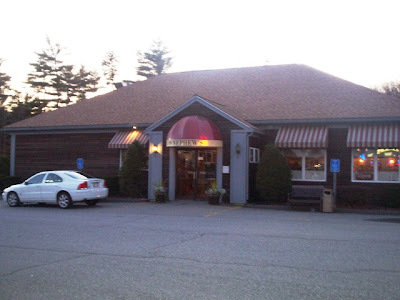 When you think of the Freetown Forest, you probably don't think of having a delicious Italian meal at a comfortable restaurant. However, if you are in the area, The Nephew's is definitely the place to be if you enjoy a relaxing dining experience with fantastic food and a friendly crowd of regulars. We can't wait to return! 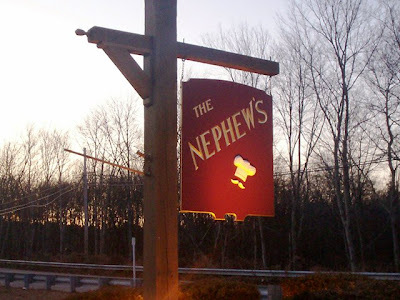 The Nephew's Restaurant opens daily at 4 p.m. They are closed on Monday.